A decade after it was rehabbed, the historic urban market known as Swan’s is looking sad: vacant stalls, papered-up storefronts, and a conspicuous lack of foot traffic. 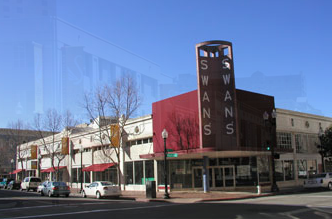 But with today’s launch of a daily organic produce stall, Swan’s made the first move in an overhaul expected to take several weeks, one that aims to reposition the historic Housewives’ Market as a mini Ferry Building in the heart of Old Oakland. Rio de Parras Organics owner Ana Bertha Juarez set out two tables of vivid, crisp-looking chard, carrots, and strawberries, grown in Salinas on land owned by the small-farmer incubator nonprofit ALBA. Last year, Swan’s owner East Bay Asian Local Development Corporation (EBALDC) — a community economic development org — hired Beehive Market founders Isaac Cronin and Julia Fry to curate a new crop of food tenants for the market. Rio de Parras had been tenant at the Beehive, the Saturday market in Berkeley that’s now defunct (Cronin vows it’ll be back, albeit in a different form). “We feel that if you give people really interesting options that are worthy of them, they’re going to come,” Cronin said. “Between the new development in Jack London and the whole area of Uptown, this is right in the middle.”Rio de Parras is open Mon.-Sat., 9 a.m.-6 p.m. Besides produce, it’ll sell cut flowers, eggs, and organic honey, all sourced from the Salinas Valley. Cronin told What the Fork that he’s close to signing other Swan’s tenants: a restaurant to replace the self-contained corner spot that was once Jesso’s, what he called a locavore beer and wine stall for the old Sam’s Wines and Liquors stall, and one or two other food vendors in the courtyard facing the Museum of Children’s Art. The next space likely to open: Cosecha Café, which obtained the old J & S Deli space before Cronin and Fry began consulting for Swan’s. Owner Dominica Rice Salomon cooked at Chez Panisse for half a decade, and hopes to have her Latin American-inflected Cali bistro open as soon as June 17, pending final inspections. Longtime Swan’s tenants Taylor’s Sausage, Japanese café Suruki’s, and the Sincere Seafood fish counter are staying put. And landlord EBALDC is also lining up funding to do general renovations to the block-wide complex, originally built between 1917 and 1940, and which also contains affordable rental units and a co-housing complex.